My personal photographer (aka my sister) has been busy with midterms and then finals. I've been busy almost every single weekend since mid-September (San Diego with my sister, then my mom visited, boyfriend's birthday, Las Vegas, and a whole slew of other shenanigans). I know for sure on my list of New Year Resolutions, "posting every 7-10 days" will be a priority! 1) Slip dresses - I own about 6 satin, 2 metallic, 1 pleated, 3 velvet, and 1 sequin slip dresses so far. So, obviously, this is my biggest obsession lately and I am just itching to share my beautiful collection, as well as the multiple ways I have either worn them or seen them be worn!! 2) Satin and my love/hate relationship with satin items that are not black. Yes. 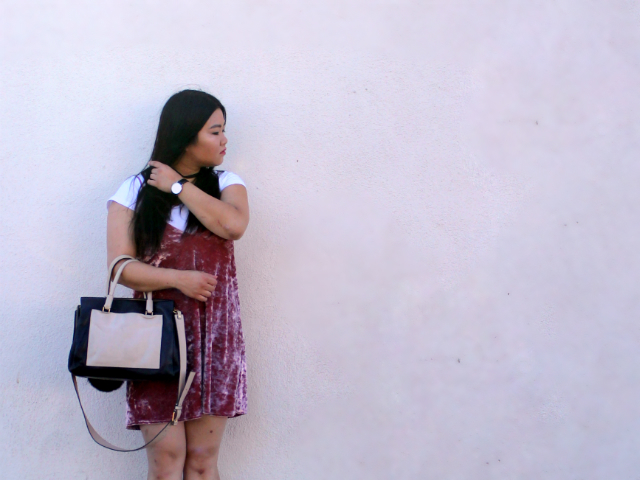 #8 is crossed out because I'm finally posting pictures from a shoot I did a few months (oops) ago wearing what le Boyfriend calls my cranberry dress!!!!!!!!!!! It may have been the new colors. It also may have been the emphasis on shine and textures this year in our world. But, O.M.G. 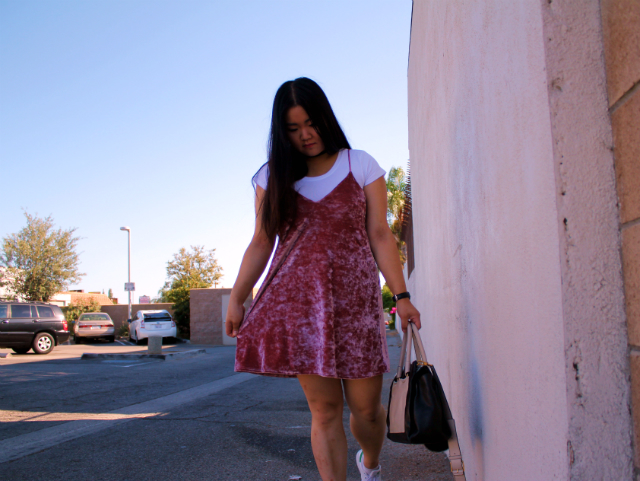 how I LOVEEEEEEEEEEEEEEEEEE CRUSHED VELVET!!!!!!!!!!!!!!!!!!!!!!!!!!!!! 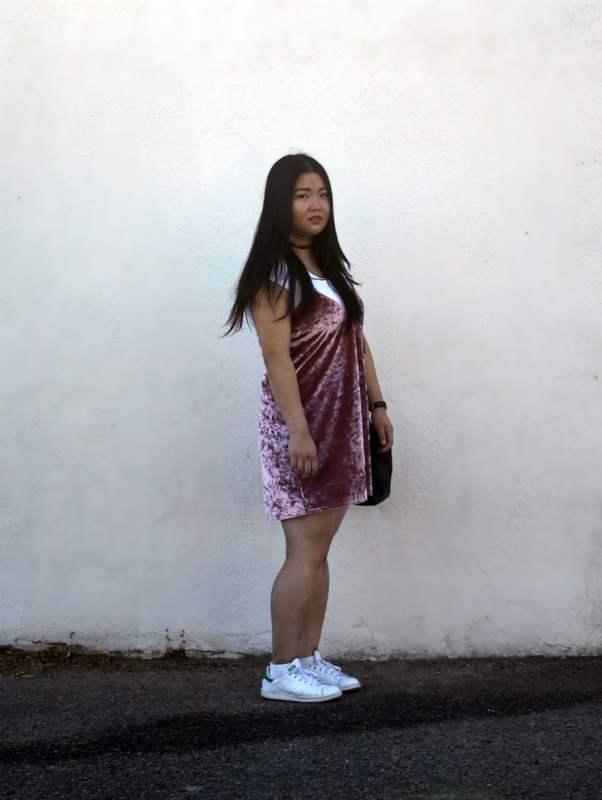 Paired with an easy basic t-shirt, I took a crushed velvet slip dress from Boohoo's Night Collection to a daytime look with classic Adidas Stan Smith sneakers. I also wanted to go for slight overkill on trends, so I threw on a skinny velvet choker. 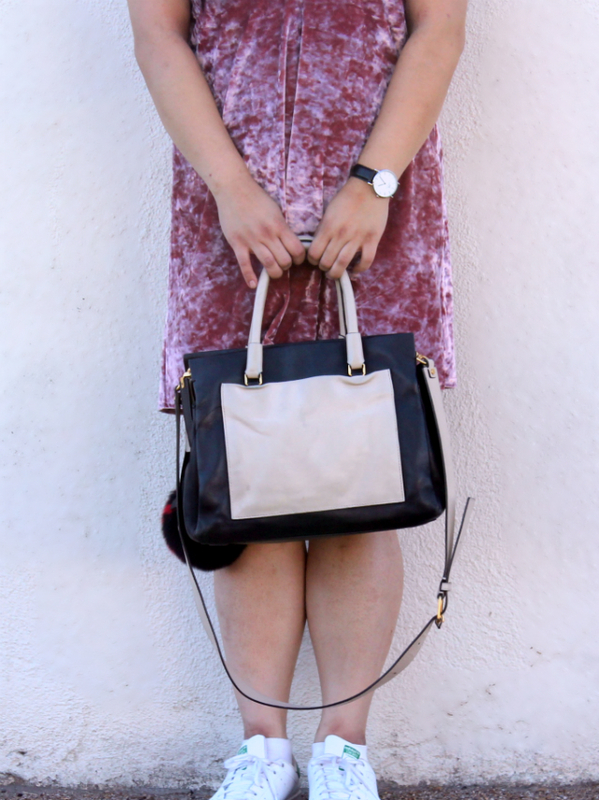 The bag I'm carrying - although not the highest end bag, my Marc by Marc Jacobs bag pictured holds a lot of sentimental value to me as it is the first designer bag I bought on my own as a "YAY ON A BIG GIRL JOB" gift to myself!